Oxalis belongs in the family Oxalidaceae, in which there are approximately 500 species. 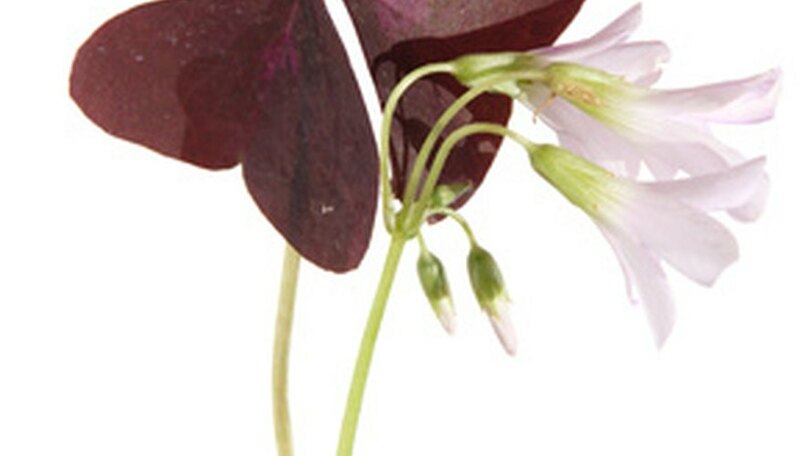 Oxalis, also known as shamrock or sorrel, have clover-like leaves in most varieties. The plant has bulbous, tuberous, or fibrous roots. Flowers range in colors of white, pink, lavender or yellow, depending on the species. Oxalis grows best planted outdoors in USDA planting zones 7, 8, 9 and 10, preferring warmer weather. Gardeners will have success planting oxalis directly into the ground, or growing it inside of containers. Relatively easy to grow, even novice gardeners should have success growing it. Plant the oxalis bulbs as soon as possible and do not allow them to remain out of the soil for too long or they will not be productive. Select an area in your garden that drains well and does not have a tendency to puddle and retain water. Oxalis bulbs will rot and die if the planting site retains too much water. Choose an area of the garden that receives full sunlight throughout the day. The stronger the light is in the planting area, the plant will produce more blooms and stronger foliage. Amend sandy soils with organic matter such as compost or peat. Apply the organic material to the existing soil and work into the ground to a depth of two to three inches. Dig a small hole that is approximately one to one-half inch deep. You want the hole just big enough for the bulb or tuber to easily slip into it and have soil coverage on top. Place a bulb that has not sprouted into the hole vertically, as it will not matter which side is facing upward as either end will root. If the oxalis bulb has sprouted, place the sprouted end facing up. Cover the bulb with soil. Water the planting site well, making sure the water seeps deep enough to drench the bulb. Continue keeping the soil moist until foliage begins to form in approximately six weeks. Cut back on watering once the plant has finished blooming and the leaves begin to turn yellow and die. The oxalis will go dormant in early fall, only to re-sprout again in springtime. Fertilize oxalis plants with a bloom boosting liquid fertilizer approximately once every 2 to 3 weeks, during its growing season. Prune off any dead foliage once it has turned brown and has become dead, if needed. Allow the leaves to remain on the plant while they turn yellow, after the blooming period, so the bulb can gather nourishment to sprout again the following season. Oxalis will bloom approximately eight weeks after planting. Oxalis will grow inside in a container, if placed in a windowsill receiving sunlight.